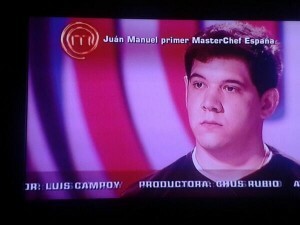 On Tuesday night, we watched the season finale of “Masterchef Spain”. It’s a TV reality show where amateur cooks dream of becoming professional chefs. The show got 33% audience share and everything should have been perfectly prepared… but it wasn’t. A little mistake in the name of the winner was retweeted into our Twitter account ( @spanish_skype ) by thousand of people: Juán mustn´t be written with tilde. Don’t forget this general rule: Words with only one syllable, are not written with tilde. We can find 5 vowels in Spanish. 3 of them are “strong vowels” (a, e, o) and 2 are “weak vowels” (i,u). Besides, every word has a strong syllable. What does it mean? (We’ll write the strong syllable in black). Strong vowels can form a single syllable themselves: Ca – sa (house), he – la – do (ice–cream). Weak vowels cannot form a single syllable and they need to be joined another vowel: Vier – nes (Friday), Rui – do (noise). But sometimes, weak vowels get the strength of the word. In these cases, they become strong vowels and they can form a single syllable: Rí – o (river), Ba – úl (chest). If the weak vowel with the strength of the word is next to a strong one, it’s always written with tilde. What happens with the name “Juan”? It is formed by 2 vowels, a weak one and a strong one. The strength of the word is on an, so the vowel u cannot form a single syllable. Therefore, how many syllables has this word got? The answer is just one. Remember that the general rule says: we cannot write tilde on words with only one syllable. And this is how a little spelling mistake may become a Mastermistake. If you don’t want to make a mastermistake, you can learn Spanish via Skype with us.